Today I have a bit of a collective overview post for you all of my favourite lip saviours that I have found in the last few weeks. For the last few months, my lips have been very dry and chapped for ages now and I've been on the hunt high and low to restore them to their former glory. I have tried so many but these are the cream of the crop for me and they've made the hits list. 1. Nuxe Reve de Miel Lip Balm- I picked this up in France last November because I forgot to pack a lip balm and my lips were not braced for the icy cold temperatures. I knew this was highly raved about but I was a little on the fence about it to be honest- I absolutely hate honey (for all you non French speakers, miel = honey) and I hate honey flavoured things and I was nervous that this would be like smearing honey over my lips. However, it's not too bad. What I love about it is that it is a really thick, matte cream that dries matte on the lips. I love to put plenty of this on at nighttime. For in and about €12, it's not too expensive and it lasts an age. I would definitely repurchase. 2. Nivea SOS Lip Relief- This is a repurchase for me. I like it because it is quite light but it tingles my lips and has a lovely cooling effect when I put it on. I often put this on first thing in the morning and let it sink into my lips before I apply any lip products ever. I think this is in and around the €4 mark so it's a great budget option. 3. 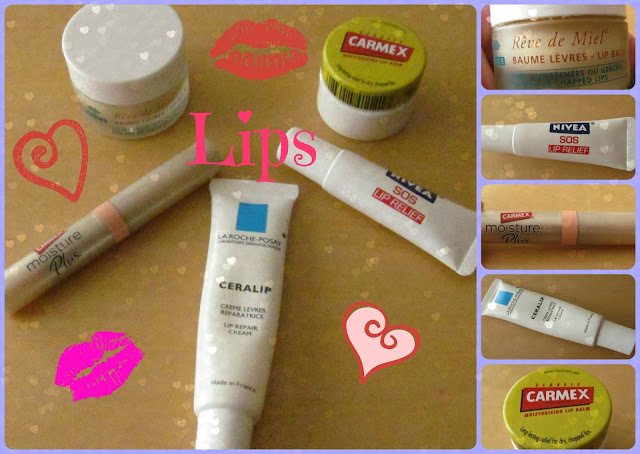 La Roche Posay Ceralip Lip Repair Cream- I've been using this since I lived in France a few years ago, and I've repurchased it since. This is a lovely, flavourless, odourless, tasteless lip cream, far creamier than your average balm, and I can almost feel this nourishing my lips as I put it on. It takes a while for it to sink in but it's an absolute godsend. I've had this one a while but I think it would set you back €8. 4. Carmex Moisture Plus Lip Balm- Now this one might be a bit of a cheat because it's a tinted lip balm, but this is like no other tinted lip balm that I have tried. The colour is meant to be 'Sheer Peach' but I think it leans a little towards the pink side. This is so handy- I often wear this in the place of lipstick, and it is nice and cooling. I love the colour, I think it's really natural, and because this isn't a little pot like the others, it's easier to put on on the go and more hygenic. This is circa €5 from Boots and there is also a pink version available. 5. Carmex Moisturizing Lip Balm- This is an old one but a good 'un, and I could never do a fave lip balm post without including this. I picked this one up for a euro in Dunnes a few months back, and I keep this one in my car as a little lip treat in traffic in town. It's smooth, it feels nice on the lips, and it helps to ward off any chapping. A real classic! 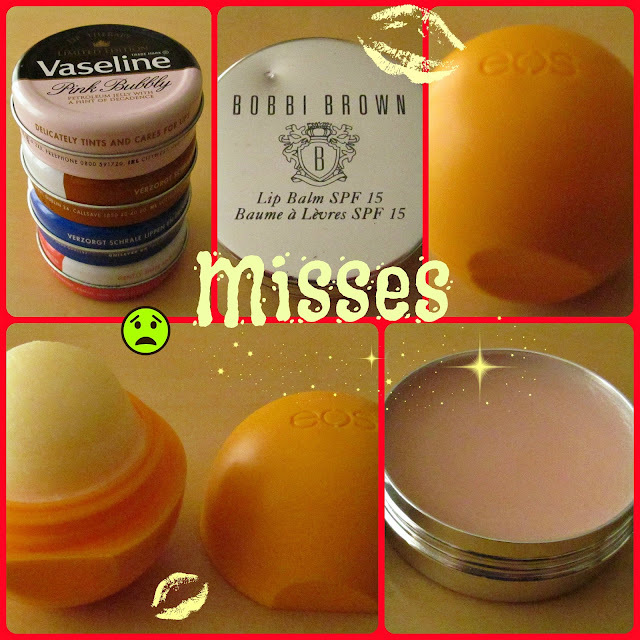 In my quest for the HG lip balm, I came across some misses, so for the sake of completeness, I will just include these. These are just my opinions on products that did not quite hit the mark. 1. Vaseline- now I know that this might be controversial, but I have come to believe that Vaseline is more of a preventative measure not to get chapped lips than it is a cure or treatment when your lips are actually chapped. I love Vaseline for other reasons and I could never be without a little pot of it but until I get my lips restored to full health, I won't be using these on my lips again. 2. 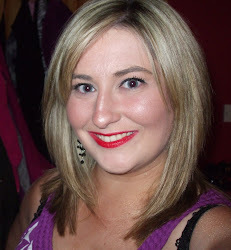 Bobbi Brown Lip Balm- I had such high hopes for this but it turned out to be a terribly expensive waste of money. I mean it's fine, it doesn't particularly taste of anything, but it's not the wonder product that I thought it would be for the price that it was. I can think of at least 10 cheaper products that would do a better job than this, it's just a bit disappointing. 3. EOS Tangerine Medicated Lip Balm Sphere- This is probably the only lip balm that I have ever tried that actually leaves my lips in worse condition then when I actually put it on in the first place. This completely parches my lips and it is such a pity. I love the packaging, it's simple and smart and hygenic, but the product itself is terrible in my opinion. There is nothing calming or nourishing about the balm itself, and it smells nice enough and the taste doesn't bother me, it just does my auld kissmakers no favours. So that's it for this instalment, I hope you found it useful! My lips are so chapped at the moment- I think it might be residual effect from the snow that we experienced last week, but I'm open to lip balm suggestions if there is a wonder product that I have been missing out on. Great post, I was thinking about buying the Eos one, I will rethink it. My lips are very dry esp. in the winter and La roche Posay Ceralip works wonders! I love the title of this post, that show is mental! I'm shocked to see that Vaseline is on your miss list but I can understand where you are coming from. I can't leave the house without my little tin! I love the Nuxe lip balm!! Have had it for ages & barely made a dent!